Shunts are used selectively on the basis of the back-pressure measured in the internal carotid artery (ICA; see the image below). Intraoperative arteriography is an important adjunct if any technical concerns arise with regard to the reconstruction. ICA is shunted during CCA-to-ICA bypass. CCA = common carotid artery; ICA = internal carotid artery. For exposure of the cervical carotid artery, a longitudinal incision along the anterior border of the sternocleidomastoid (SCM) is standard. The incision may be extended proximally toward the sternal notch or distally towards the mastoid process as needed. Soft tissue and platysma are divided, and the dissection is carried through the anterior border of the SCM until the carotid sheath is encountered. If only the lower half of the ICA and the bifurcation require exposure, the internal jugular (IJ) vein is mobilized anteriorly; higher-level dissections are better visualized via a retrojugular approach. The facial vein branch of the IJ vein usually identifies the bifurcation. It is important to identify the hypoglossal nerve (cranial nerve [CN] XII) before dividing this vein because it can run behind and in proximity, particularly in high bifurcations. The vagus nerve (CN X) usually runs in the posterior carotid sheath but can spiral anteriorly and must be identified. For high exposures of the ICA, the dissection is carried upward toward the mastoid process. Care must be taken to avoid injury to the spinal accessory nerve (CN XI), which enters the SCM at that level. Care must also be taken to identify the superior laryngeal nerve, which hugs the ICA. The posterior belly of the digastric muscle can be divided with impunity. Further exposure is limited by the styloid process and the mandibular ramus, but these structures can be resected or removed to facilitate more distal access. Anterior subluxation of the mandible allows greater visualization of the distal ICA, which is accomplished by dividing the styloid process. A common carotid artery (CCA)-to-ICA bypass with a polytetrafluoroethylene (PTFE) graft, performed for aneurysmal disease of the ICA, is shown in the image below. 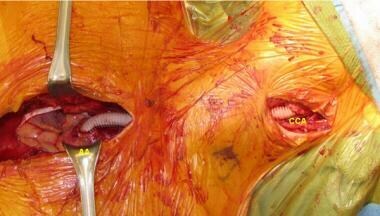 CCA-to-ICA reconstruction with 6-mm PTFE graft, performed for aneurysmal disease of carotid bifurcation. CCA = common carotid artery; ECA = external carotid artery; ICA = internal carotid artery; IJ = internal jugular vein; PTFE = polytetrafluoroethylene. If arterial inflow is needed from the subclavian artery, supraclavicular exposure of the vessel is most often performed. The skin is incised transversely above the clavicle. Subcutaneous tissue and platysma are divided, and the dissection begins lateral to the jugular vein. The scalene fat pad can be either reflected or excised. Meticulous ligation of all blood and lymphatic vessels is performed. The phrenic nerve is dissected off the anterior scalene muscle and preserved; the muscle can then be resected. Resection of a portion of the muscle is recommended to prevent reattachment and subsequent compression. The arteriotomy is made in the superior wall of the subclavian artery. Any plaque at this level is left undisturbed, and any separation of the intima-media layer from the elastic lamina is affixed to the wall and incorporated in the suture line. The proximal anastomosis is created by using a parachute suturing technique, which allows precise placement of the sutures without any slack in the subclavian artery. The graft is then tunneled to the carotid bifurcation behind the jugular vein ascending parallel to the native CCA. Traditionally, the ascending aortic arch and supra-aortic trunk vessels are approached via a median sternotomy. After the sternum is divided with an oscillating saw, the innominate vein is mobilized and the thymic vessels ligated. The ascending aorta is approached below the innominate vein after the pericardial sac is opened. A partially occlusive side-biting aortic exclusion clamp can be placed without the need for heparinization. With the clamp secured, the aorta is opened, and the beveled end of the graft is anastomosed to the vessel with a continuous 4-0 or 3-0 polypropylene suture. To prevent air embolization, the patient is placed in the Trendelenburg position, and the anatomosis is tested and vented. If the anastomosis is found to be satisfactory, an occlusive clamp is placed immediately above it, and the table is returned to the original position. The patient is heparinized before the distal anastomosis is begun and after the graft has been tunneled. An aorta-to-CCA reconstruction for a patient with extensive radiation arteritis of the left CCA is shown in the image below. Aorta-to-CCA bypass using 8-mm Dacron graft. AA = ascending aortic arch; CCA = common carotid artery. If inflow to the CCA is compromised in the mediastinum, donor inflow can be obtained from a healthy contralateral CCA. The bypass between the two CCAs lies low in the midline, extending across the neck through the retropharyngeal space. The tunnel for the bypass is behind the pharynx and in front of the prevertebral fascia. A nonringed prosthesis up to 8 mm in diameter can be tunneled without pharyngeal compression (see the image below). CT scan demonstrating CCA-to-CCA bypass using retropharyngeal route. 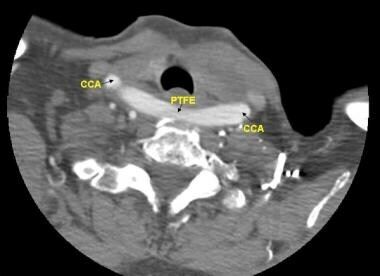 CCA = common carotid artery; PTFE = polytetrafluoroethylene (bypass graft). Hage ZA, Behbahani M, Amin-Hanjani S, Charbel FT. Carotid bypass for carotid occlusion. Curr Atheroscler Rep. 2015 Jul. 17 (7):36. [Medline]. Zhou W, Lin PH, Bush RL, Peden E, Guerrero MA, Terramani T, et al. Carotid artery aneurysm: evolution of management over two decades. J Vasc Surg. 2006 Mar. 43 (3):493-6; discussion 497. [Medline]. Lauder C, Kelly A, Thompson MM, London NJ, Bell PR, Naylor AR. Early and late outcome after carotid artery bypass grafting with saphenous vein. J Vasc Surg. 2003 Nov. 38 (5):1025-30. [Medline]. Naughton PA, Garcia-Toca M, Rodriguez HE, Pearce WH, Eskandari MK, Morasch MD. Carotid artery reconstruction for infected carotid patches. Eur J Vasc Endovasc Surg. 2010 Oct. 40 (4):492-8. [Medline]. Sessa CN, Morasch MD, Berguer R, Kline RA, Jacobs JR, Arden RL. 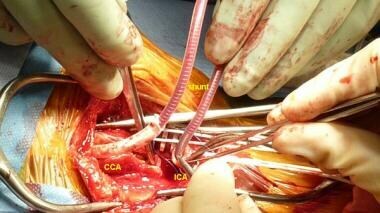 Carotid resection and replacement with autogenous arterial graft during operation for neck malignancy. Ann Vasc Surg. 1998 May. 12 (3):229-35. [Medline]. Berguer R, Morasch MD, Kline RA, Kazmers A, Friedland MS. Cervical reconstruction of the supra-aortic trunks: a 16-year experience. J Vasc Surg. 1999 Feb. 29 (2):239-46; discussion 246-8. [Medline]. Berguer R, Morasch MD, Kline RA. Transthoracic repair of innominate and common carotid artery disease: immediate and long-term outcome for 100 consecutive surgical reconstructions. J Vasc Surg. 1998 Jan. 27 (1):34-41; discussion 42. [Medline]. Welleweerd JC, den Ruijter HM, Nelissen BG, Bots ML, Kappelle LJ, Rinkel GJ, et al. Management of extracranial carotid artery aneurysm. Eur J Vasc Endovasc Surg. 2015 Aug. 50 (2):141-7. [Medline]. [Full Text]. Skóra JP, Kurcz J, Korta K, Szyber P, Dorobisz TA, Dorobisz AT. Surgical management of extracranial carotid artery aneurysms. Vasa. 2016. 45 (3):223-8. [Medline]. Illuminati G, Belmonte R, Schneider F, Pizzardi G, Calió FG, Ricco JB. 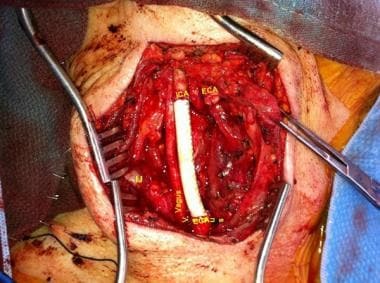 Prosthetic bypass for restenosis after endarterectomy or stenting of the carotid artery. J Vasc Surg. 2017 Jun. 65 (6):1664-1672. [Medline]. Stilo F, Sirignano P, Montelione N, Mansour W, Capoccia L, Catanese V, et al. Bypass for symptomatic in-stent carotid restenosis. Int J Cardiol. 2017 Dec 15. 249:392-395. [Medline]. Spinelli F, Martelli E, Stilo F, Pipitò N, Benedetto F, Spinelli D, et al. Carotid bypass: a safe and durable solution for recurrent carotid stenosis. Ann Vasc Surg. 2014 Jul. 28 (5):1329-34. [Medline]. Illuminati G, Pizzardi G, Calio FG, Masci F, Pasqua R, Frezzotti F, et al. Results of subclavian to carotid artery bypass for occlusive disease of the common carotid artery: A retrospective cohort study. Int J Surg. 2018 May. 53:111-116. [Medline]. Roddy SP, Darling RC 3rd, Ozsvath KJ, Mehta M, Chang BB, Paty PS, et al. Choice of material for internal carotid artery bypass grafting: vein or prosthetic? Analysis of 44 procedures. Cardiovasc Surg. 2002 Dec. 10 (6):540-4. [Medline]. Chen C, Ye Z, Luo L, Guo Y, Chang Y, Ning X, et al. Carotid-Carotid Artery Crossover Bypass with a Synthetic Vascular Graft for Symptomatic Type 1A Common Carotid Artery Occlusion. World Neurosurg. 2018 Mar. 111:e286-e293. [Medline].